Modern industry needs far more from its suppliers than straightforward product sales. Instead, today’s technology providers must support their customers with accessible and professional targeted services that aid plant and equipment efficiency and reliability and minimise costly and disruptive downtime. 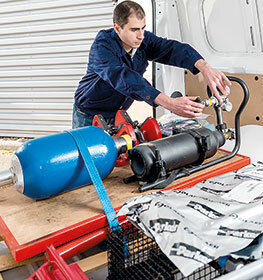 One area where this is relevant is gas-loaded hydraulic accumulators, which store energy or smooth out pulses or shock when installed within hydraulic systems. A hydraulic system with an accumulator can use a smaller pump because the accumulator stores energy from the pump during periods of low demand. This energy is available for instantaneous use, released upon demand at a rate many times greater than what could be supplied by the pump alone. Industrial applications may include bladder, piston or diaphragm accumulators, each offering particular advantages and limitations depending on the specific application. When properly applied in an hydraulic circuit, accumulators can have a long and reliable life. Regular maintenance is critical in order to maintain production efficiency and control cost. To minimise the risk of downtime, engagement with an accumulator service team that offers fast and easy access will provide numerous benefits. This can help combat and even eliminate a number of potential technical and performance issues which can affect accumulators in service. Selecting the optimum supplier of accumulator services is paramount, and there are several factors to consider for those seeking comprehensive and innovative support. Firstly, only consider suppliers with a dedicated resource for accumulator services as this will help guarantee the necessary expertise, experience and responsiveness. When a hydraulic system begins to underperform or fail, it can prove extremely disruptive to operations, so a professional support team is vital. New directives, including the Pressure Equipment Directive 2014/68/EU, place requirements on manufacturers and those who ‘place equipment on the market’ and national regulations require most accumulators to be independently checked and recertified on a regular basis. However, despite the financial and legal risks, it is estimated that 80% of accumulators in Europe are not fully compliant with legislation. Parker Accumulator Service Centres have been established with certified Parker distributors to optimise customer systems by combining industry-leading products backed by quality service, to deliver stress-free accumulator management alongside maximised performance, efficiency and safety. With training and certification provided by Parker, Accumulator Service Centres offer detailed product knowledge and expertise. Customers can benefit from services such as system improvement, as well as accumulator maintenance, recertification and pre-charging – complete with audits, scheduled inspections and replacements. With locations across Europe, Parker service centres offer an integrated solution that combines products, services and technologies, whether on an in-house (at the service centre), mobile or onsite basis. With an in-house service solution, the accumulator is sent to the service centre, while for mobile solutions the service centre travels, with equipment, to the customer facility using a vehicle. For onsite solutions, the service centre establishes a fully equipped container workshop on location. With regard to the use of original spare parts, tangible benefits include shorter inspection time and the reduction of complexity in logistics (tracking systems, data monitoring and recording) and documentation, both of which help to lower costs and save time. Service centres can utilise the Parker Tracking System (PTS), which helps schedule accumulator maintenance, providing automated notifications on inspections and replacement parts.